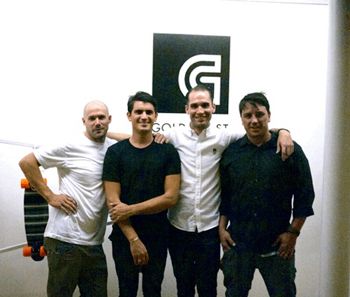 August 2, 2013 (Salt Lake City, Utah) – GoldCoast Skateboards hosted a party at its new global headquarters in Salt Lake City last night to celebrate bringing the brand’s product design, assembly, sales, marketing and distribution under one roof. Industry players visiting Salt Lake City for the Outdoor Retailer trade show joined all the local skateboarders, snowboarders, retailers and media attending the GoldCoast event. Partygoers sipped PBRs and Red Bull Vodkas while checking out the new design-driven GoldCoast line and a collection of photographs by Weston Colton at the company’s new offices. “We are so glad to be able to consolidate by bringing product design, assembly and distribution to our new office. It will make our processes so much more efficient and create jobs right here in Salt Lake City,” said GoldCoast’s Sales and Marketing Director, Chris Brunstetter. Despite the sluggish global economy, GoldCoast has continued to grow and increase its distribution around the world. The brand is currently sold in 15 countries throughout North America, Europe and Asia Pacific. For the latest details on GoldCoast, check out skategoldcoast.com and connect with the brand on Facebook, Instagram and Twitter.